For Flat Panels up to 40 lbs. 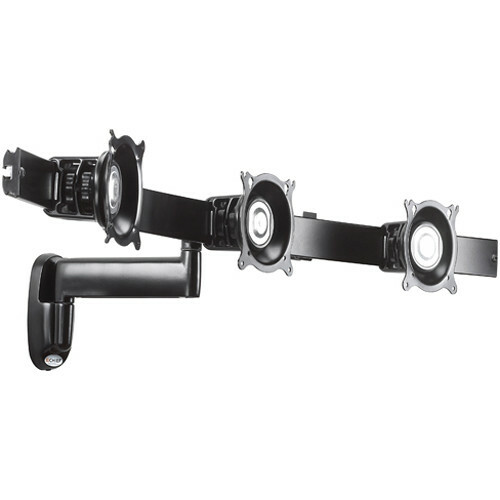 The Chief KWS320S Single Swing Arm Wall Mount swings small flat panel displays from 10-18" (up to 40 lbs.) out from the wall for closer viewing and provides smooth pivot and tilt adjustments for ergonomic needs. To confirm the compatibility of this mount with your flat panel TV or monitor, visit Chief's MountFinder Pro. VESA-compliant (75 x 75mm or 100mm x100mm). Interface brackets are available for non-VESA compliant displays. Easy to install. Simply attach wall plate to single stud. Then slide mount onto plate. Attach display to mount. (Teardrop hole patterns makes mounting the screen quick and easy). Secure hardware. Built-in cable management for a clean installation. Simply route cables through the predefinded pathway inside the arm. Patented Centris technology provides smooth, fingertip tilt in all directions using the screen's center of gravity. Screen angle stays set until you decide to re-adjust. Provides up to 9.4" extension with a single swing arm. Portrait and landscape rotation and side-to-side pivot (pivots 180° at wall plate). Folds in close (2.2") to the wall for a low-profile appearance.